I see that the LET are in the Middle East this week, at the Fatima Bint Mubarak Ladies’ Open in Abu Dhabi. Some of the women warmed up in the Liwa Desert, which is proper desert, one never-ending bunker with massive dunes that look suitably spectacular in the publicity shots and give you an inkling of how awesome the place must be. The golf course is on the coast as the name – Saadiyat Beach – would suggest and there there’s plenty of grass flourishing in the middle of all the sand. Belen Mozo, Amy Boulden and Inci Mehmet take the bunker shot to extremes [Getty]. That got me thinking about the weird and wonderful places where golf rears its head, the unlikely venues for courses, which, of course, were originally developed on scrubby old linksland that wasn’t suitable for much else. When Dai and I wrote Beyond The Fairways, we included a bit on golf in the desert and I was dispatched to talk to Tom Weiskopf, who won the Open at Troon in 1973 and later, based in Arizona, moved into golf course design with Jay Morrish. A bit of a crosspatch at the best of times, Weiskopf was even grumpier than usual when I spoke to him because he’d just had a double bogey at the last hole of whatever seniors event he was playing in. Not many players are in the best of humour after that sort of finish and I’ve still got the cassette tape of the interview somewhere. The sound track includes the clack clack clack of metal spikes as Weiskopf, a tall man, strode up the hill to the clubhouse with me scuttling after him trying to ask vaguely sensible questions of someone who couldn’t wait to be somewhere else. “Ah.” Clack, clack, clack. Puff, puff, puff. A couple of efforts to extract some more info were relatively successful as it turned out and it’s amazing how you can expand on a curt answer when you’re desperate enough. However, the tape reveals that the interviewer located her own inner crosspatch – never all that difficult – when she asked what lessons the golfer-turned-architect had learned over the years. The “interview” was at an end. Not that I hold grudges but I have to admit that that encounter may be one of the reasons why I find it so hard to like Loch Lomond, a much-praised Weiskopf creation in one of the wettest parts of the British Isles, a place where, if the loch doesn’t get you, the water table will and where it was only relatively recently that anyone dared to build a golf course. It’s a beautifully crafted course in a spot that’s beautiful on a sunny day. I may have been there on one of those but usually it’s been raining and soggy – see the underwater Solheim Cup in 2000 – and the first time I played there we were put off the 10th and, well, the relationship has never recovered! Not an easy task to stay on the grass and clear of the saguaro. I am partial to a bit of high desert, home of the magnificent saguaro cactus, the one with the arms, a symbol of the American west and a staple of many a Western. 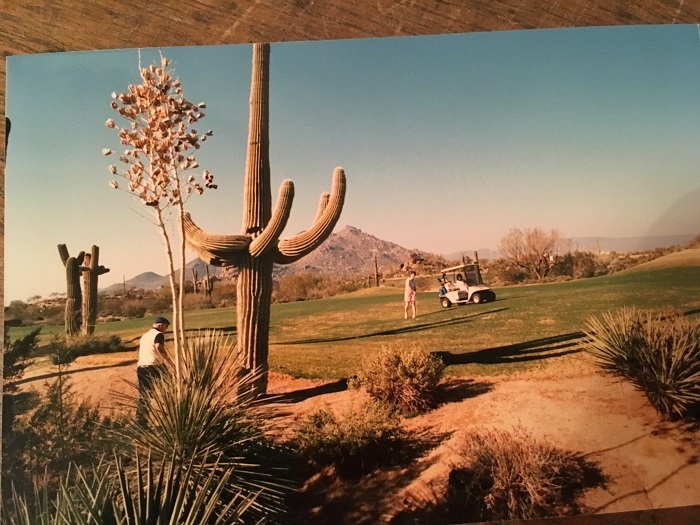 The Tradition, a senior major, at Desert Mountain, north of Phoenix, was always a treat, not least because of the drive up to the course as the houses became scarcer, if grander and the landscape took over. Done well, desert courses are wonderful and a pleasure to play – as long as you can hit it straight enough to keep it on the grass and away from the rattlesnakes, the prickly pear, cholla and assorted scrub – but some of the less accomplished are, in the words of a well-travelled Scot, “a waste of a perfectly good desert”. Back in Abu Dhabi, Saadiyat Beach looks recognisable as a golf course and there’s the added bonus of a member of the Woods family playing decent golf, a treat in itself. Cheyenne, Tiger’s niece, had her first hole-in-one as a professional in the second round and was sharing third place at the halfway stage. Game on. 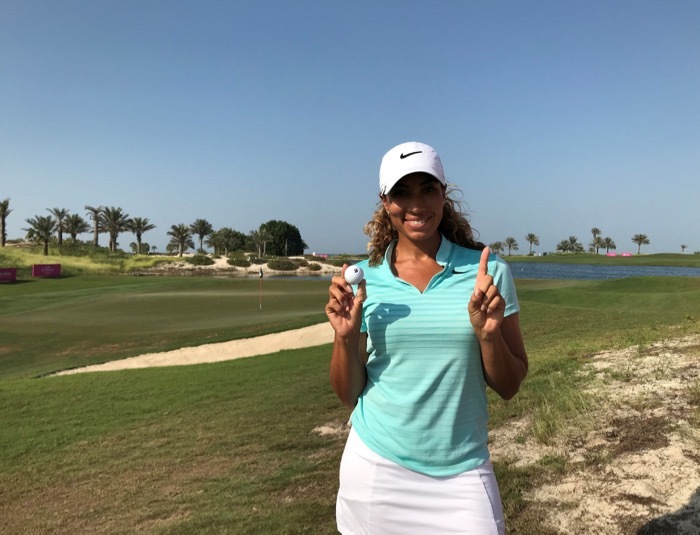 Cheyenne Woods celebrating her hole-in-one at Saadiyat Beach [LET]. 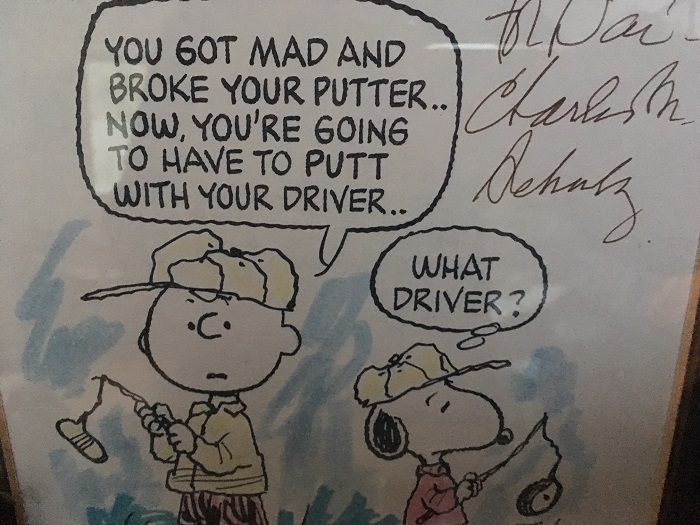 I’m fast approaching my 25th anniversary of teaching golf to players of varying levels and when I think back and ponder those early lessons that I gave I shudder somewhat. In reality, I suppose if my thinking wasn’t markedly different after a quarter of a century then it would indicate that I hadn’t progressed, either in my own knowledge or as a communicator. And, of course, I like to think I have! It seems to me now that the less skilled the coach the more complicated the message and the delivery thereof to the pupil. The better the coach the simpler the advice and the easier it should be for the pupil to grasp. In the 1990s I did a great deal of my coaching using the latest video systems, drawing endless lines on the computer screen and pulling up slow motion swings of the top players in the world to set alongside the action of the hapless pupil. Who exactly was THAT helping?! Well, it was certainly helpful to a young coach who was not yet accustomed to looking at thousands and thousands of swings and whose eye was not yet quick enough to pick up what was going on in the swing without the aid of the slow motion replay. But did it really help Joe Bloggs to share a split screen with Tiger Woods and have it dissected frame by frame? 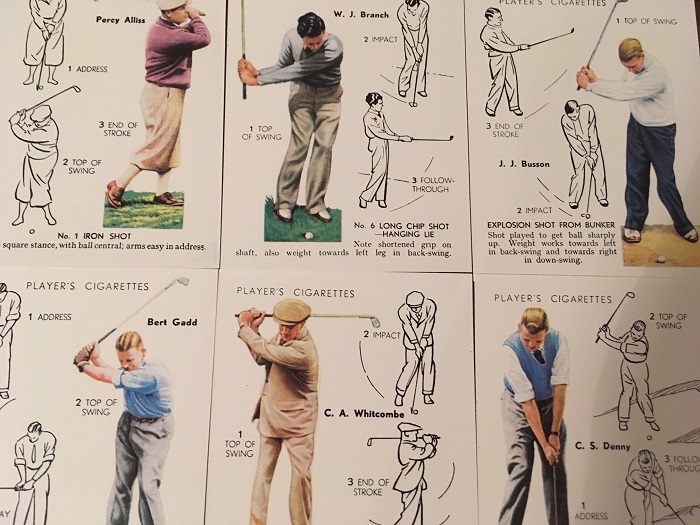 It was intellectually interesting for me – and often for the pupil – but did Mr Bloggs really set off on his next round of golf feeling he was on the right track to becoming a better player? I suspect not, given that his inadequacies compared to the best player in the world must have been firmly in his mind. Empowering or what?! Patricia was so horrified by her one and only video lesson that it took her weeks to recover and she’s never had another one since. Still-life instruction from an earlier time. I rarely use technology with any of my pupils now for a number of reasons, the principal one being I don’t see it accelerating their improvement. Most golfers have no idea what they look like when they swing a golf club but they may watch golf on telly. When faced with a video of their own swing they are frequently distracted from the core information that will actually help them improve and that information may not necessarily be technical. This sport we play is a physical, emotional and mental mix and lots of skills are relevant to us becoming better players of the game, including how we think, plan, strategise and encode emotion. Under no circumstances should you confuse a good striker of the ball with a good player. It simply means what it says on the tin – that person is a good striker of the ball, no more no less. In the professional ranks the practice grounds of this world are full of good strikers but they don’t make a bean because they lack all those other attributes required to be a PLAYER. Some players find the game harder than others. 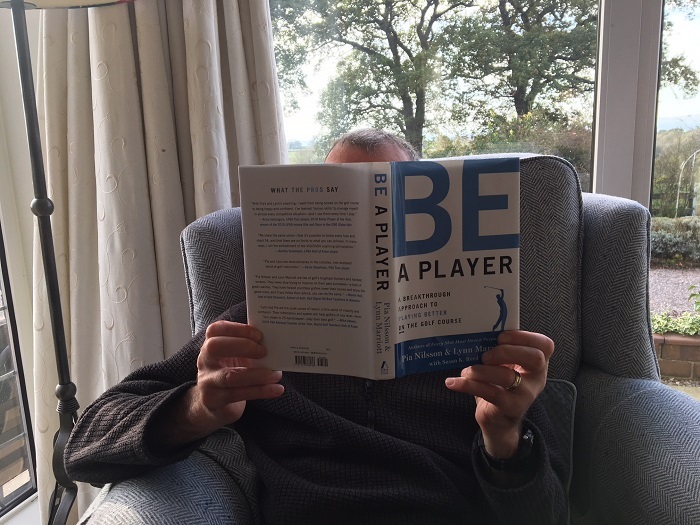 “BE A PLAYER” by Pia Nilsson and Lynn Marriott. It’s a treasure trove of information and fun exercises to carry out on the course, with development of our human skills at its forefront. If you want a join-the-dots description of the golf swing it’s not for you. If you want to be a better golfer, it is. Pia and Lynn are amongst the most innovative coaches in sport, never mind golf, and they are slowly but surely chipping away at the overly complicated approach to golf instruction by helping golfers of all standards improve their performance in new and enjoyable ways. Don’t just put your nose in any ole golf book – put it in this one! Finally, a word of advice for anyone seeking a coach either for themselves or a friend. Steer clear of highly technical teachers who pay scant attention to anything other than physically swinging a club and hitting the ball. Trust me, that is not the whole game. Search out a more rounded individual who spends time on the course with their pupils and views the game holistically. A good coach makes the game FUN with all sorts of challenges (sometimes seemingly unrelated to golf) thrown in the pupil’s path. He or she is developing the skills needed for that pupil to be a better golfer. Ah, the things I wish I’d known 25 years ago!